Harry’s War is one of those movies I have often thought about since seeing it back in the 80s, but was unable to ever find a copy to watch. I think this is one of the truly underrated movies of all time. 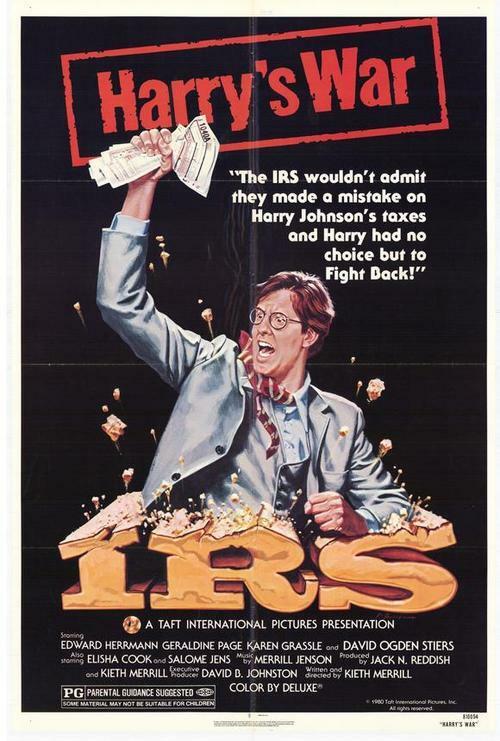 Harry’s War is a movie about the injustice of unfair taxation and the fact that the Internal Revenue Service (I.R.S.) is seemingly above the law and able to trump the rights guaranteed to the U.S. population in the Constitution (by the way, I am not an American, so I look at this from the outside). It’s about one man that has exhausted all legal avenues and is forced to take action… to declare war on the I.R.S. Starring one of those “That Guy” actors as the title character, Edward Herrmann is Harry Johnson – lowley, meek postman that inherits his adopted ’Aunt’ Beverly Payne’s (played by Geraldine Page) soup kitchen/Antique/military surplus when she dies in tax court fighting the I.R.S. Running a charitable service, providing food ans comfort to those less off than her, she has come under the scrutiny of the I.R.S. and particularly that of Ernie Scelera, IRS District Director (David Ogden Stiers of M,A,S,H. fame), who believes that she ia actually running a political organization ans shirking her tax obligation. Scelera make it his mission to bring down Payne, saddling her with a $150,000+ tax bill, and no fair way to contest it. Asking Harry to come and help, he does just that, and shortly after arriving, is asked to take over the operation, as Payne just doesn’t have the strength anymore to keep going AND battle the I.R.S. Harry picks up the torch and beging the fight. Soon, court Aunt Patne passes away and Harry must take both burdens – which he does. After not gainig any traction with the I.R.S. by following their rules, he declsres war on the I.R.S. publicly by driving through the wall of a local news station and publicly declaring his intenet in the middle of an interview with Director Scelera. The rest of the story is the physical and willful battle between the little guy and the Big Government Juggernaut. Attempts to isolate Harry from the press are foiled and he gains a grass roots following. Even when the army is brought in, they aren’t exactly sure they’re on the right side of the battle. This is a feel good story with a serious message that still manages to stay funny – not an easy thing to do. A good cast, and good writing manages to overcome an obviously low budget. This movie has been traditionally very hard to find, as it only aired on TV once since it left the theatres it was released once on VHS, and then in 2005 saw the same VHS copy slapped onto a DVD. Both are long out of print. I was surprised this morning when it popped up on Netflix as a suggestion for me – I of course watched it immediately. Available on Netflix, I have also found a copy on Youtube, though it is missing the first 5 or so minutes, I will link to it, as enough of the film is there that you should have no issue following the story – the only thing you miss is a bunch of people enjoying a meal provided by “Aunt” Payne and a little political diatribe – and you see the guy with the beard start a tape recorder recording. If you don’t have Netflix, then I say watch the Youtube copy – It’s better than not watching at all. Just watch this movie – it’s awesome. This entry was posted on July 11, 2012 by catfishman. It was filed under Uncategorized and was tagged with .R.S., 1981, action, classic, comedy, constitution, David Ogden Stiers, Edward Herrmann, fight the power, film, freedom, Geraldine Page, Harry's War, justice, little guy, lost, military, movie, taxation, the man, underdog, underrated, war.